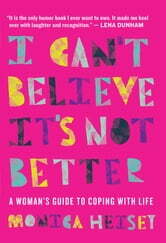 I Can't Believe It's Not Better is a collection of stories, essays, advice, and drawings from writer and comedian Monica Heisey. Created to help you live your Best Life, this book offers tips on everything from workplace politics to sexting, from how to make your apartment look like you read design blogs to where to cry in public. Important guides like "How To Watch Literally Hours of TV At A Time" will help you sort your life out for good, while thought—provoking personal essays such as "Pizzas I Have Loved" and helpful exercises like "Are You Being Flirted With, A Quiz" provide some gravitas and perspective to help you navigate this modern world. Plus there is a very weird short story about bees. 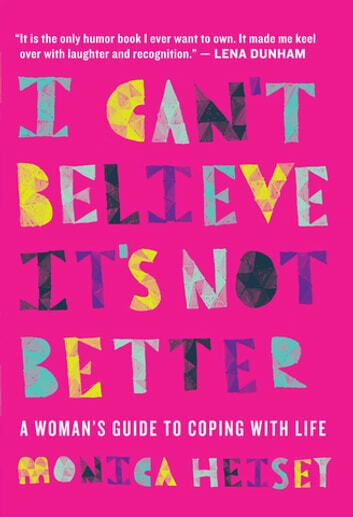 Funny, smart and charming, this book is the perfect accompaniment to your next life crisis, or at least an easy and appropriate gift for the niece you don't know very well but want to impress. WHERE do I even START with this magical work of art? I feel like it's not enough to just say how much I loved I Can't Believe It's Not Better; I need you guys to KNOW that I was literally gasping with delight and recognition while actually (no but actually) laughing out loud throughout the entire dang thing. This book turned me into a crazy person walking down the street, giggling to myself as I remembered one of Heisey's jokes ("Secret Nap"). People of the world, do yourself a favour: read this book. It will make you a happier person, and for that reason alone I can't recommend it enough.